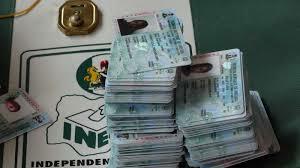 Police in Akwa Ibom State are on the trails of some person who allegedly broke into the Independent National Electoral Commission (INEC) office, in Okobo Local Government Area of the state and reportedly stole about 2,045 Permanent Voters Cards (PVCs). INECâ€™s National Commissioner supervising Akwa Ibom, Delta and Cross River states, Dr. Mohammed Mustapha Lecky, disclosed this, on Tuesday, at the Commissionâ€™s office, in Uyo, during a press briefing to mark the completion of his tour of the state. Lecky said the commission was working with the police to apprehend those who carted away the PVCs, assuring that the incident would not affect the 2019 elections. â€œYouths protesting the outcome of the House Reps primaries for Oron Federal Constituencies of one of the political parties, allegedly broke into INEC office and carted away the PVCs and other electoral materials. â€œI think it was a mob action which was a consequence of the primaries elections that were taking place at that time and I want to assure you that the police are looking into the matter. These things (PVCs) were stolen from where we kept them for safety. â€œLike I have said what they (hoodlums) have done is a nullity because we have a list of everybody; we have their names; we have their pin numbers and we have their pictures on the votersâ€™ register. It is a matter of reproducing the PVCs and making them available. â€œBut we still have to go after those culprits who were responsible so that we can apprehend them and punish them according to the lawâ€, he said. The INEC national commissioner also frowned on the reluctance of voters to collect their PVCs from the difference INEC offices nationwide, lamenting that there millions of PVCs not yet collected by their owners. â€œPVC is your right. So collect them and when you collect them please come out to vote. We have don elections and by-elections all over the country and only about 10 percent of the registered voters come out to vote. â€œSo, collect your PVC and come out on election day en-mass to vote; let us have about 60 percent of voters come out to vote,â€ Lecky said. Lecky dispelled the insinuation that federal might would be used truncate the credibility of next yearâ€™s election in favour of the All Progressives Congress (APC), adding that the current leadership of the INEC would not pander to the interest of any political party. He warned politicians not to flout INEC regulations by kick-starting campaigns before November 18th fixed by the commission saying that so far, a lot infractions have been observed in the state in that regard. The INEC resident electoral commissioner in the state, Mr. Mike Igini gave the assurance that he would ensure that credible and transparent elections conducted in Akwa Ibom State. â€œUnder the current leadership under my watch in this state and with our Commissioner of Police, we will maintain absolute, unqualified neutrality to provide a level playing field to leave behind a legacy and electoral process where attitude are shapedâ€, Igini said.